When your doctor sends specimens from your surgery to the pathologist for confirmation, the pathologist will be looking for glands and/or stroma ("Histologic demonstration of a combination of endometrial glands and stroma in biopsy specimens obtained from outside the uterine cavity is required to make the diagnosis of endometriosis." http://emedicine.medscape.com/article/271899-overview). "Stromal endometriosis, characterised histologically by small microscopic nodules or plaques of endometrioid-type stroma, sometimes with a whorled pattern and prominent vascularity and erythrocyte extravasation, was identified in 44.9% of the biopsies. In 6.6% of the biopsies, stromal endometriosis occurred without typical endometriosis. The foci of stromal endometriosis usually had a superficial location just beneath the mesothelial surface or protruding above this. Associated histological features present in some cases included reactive mesothelial proliferation, inflammation, giant cell or granuloma formation, haemosiderin pigment deposition, microcalcification and decidualisation and myxoid change. 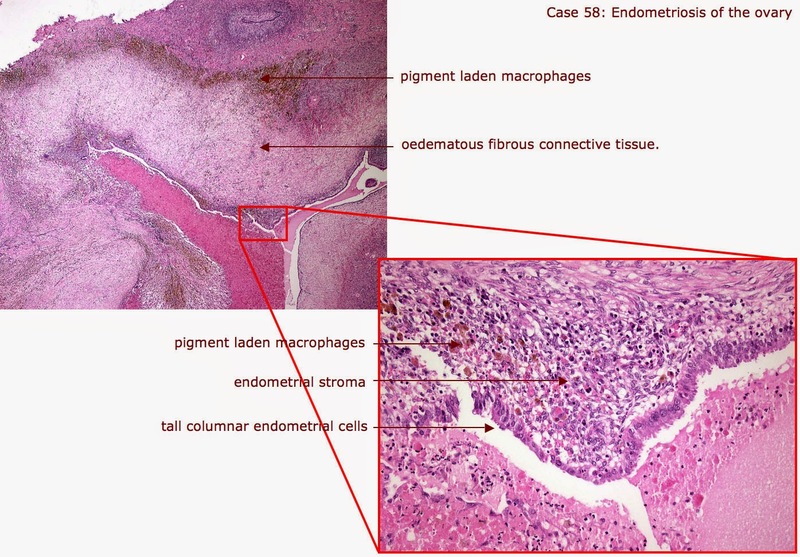 “Although the histological diagnosis of endometriosis is usually easy to make, there are diagnostic problems in relation to certain aspects such as the atypias and neoplastic alterations of the endometriotic glandular and stromal components and in cases of endometriosis in unusual places the small size of specimens available for histological examination does not aid the correct diagnosis…. present different clinical presentation, epidemiologic and etiologic patterns…. morphological appearance of endometriosis and may lead to diagnostic difficulties….